Ah well, another legend I didn't get to see before he died. It was the music. Never was there anyone funkier than James Brown. I was going to say, if you searched the word "funk" on Wikipedia, there would probably be a picture of James Brown. So I did just that. Funk is an African American musical style. It originated in the 1960s with performers such as James Brown, Sly and the Family Stone, and The Meters, and emerged as a distinct genre by the 1970s. Here's something about the music. Listen to it. The downbeat is the main thing. He emphasizes the one. Brown's music plays off the one. Rock plays off the two and four. Reggae off the three. The one. That's what makes it so solid. The Godfather always had ground-breaking musicians with him. But in a certain sense, always quintessentially American, with that polish, that sheen that top American acts seem to have. It's showbiz, man. Sometimes in his songs (maybe often) he would tell the band what was coming next. "Take me to the bridge" he'd say. Or "Down D, Funky D." He also devised a whole set of hand signals and even foot movements to send messages to the band. They always knew when the break was coming. 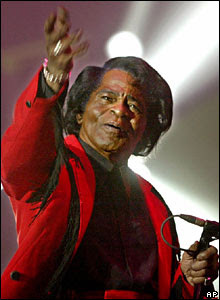 When I was a teenager...never mind when...long enough ago...James Brown was the man. We would go to see bands, and if they could cover a James Brown tune with style, that was way cool. In fact, there were a couple of bands in old Lunchbucket that could do passable, even good covers of James Brown. Tomorrow is Boxing Day. I think I'll spend part of it listening to James, the Godfather.